My paper on the phylogeography of the American black bear (sub) was recently published. Phylogeography is the study of the historic processes that shape the contemporary distribution of a species’ genetic diversity. This means we can reconstruct how species moved across their range to come to their current distribution by looking at their genetics. Populations that diverged from each other recently will have more similar genetic signatures than populations that diverged from each other longer ago. We can also tell when a population is the product of two populations mixing together, which we call admixture. 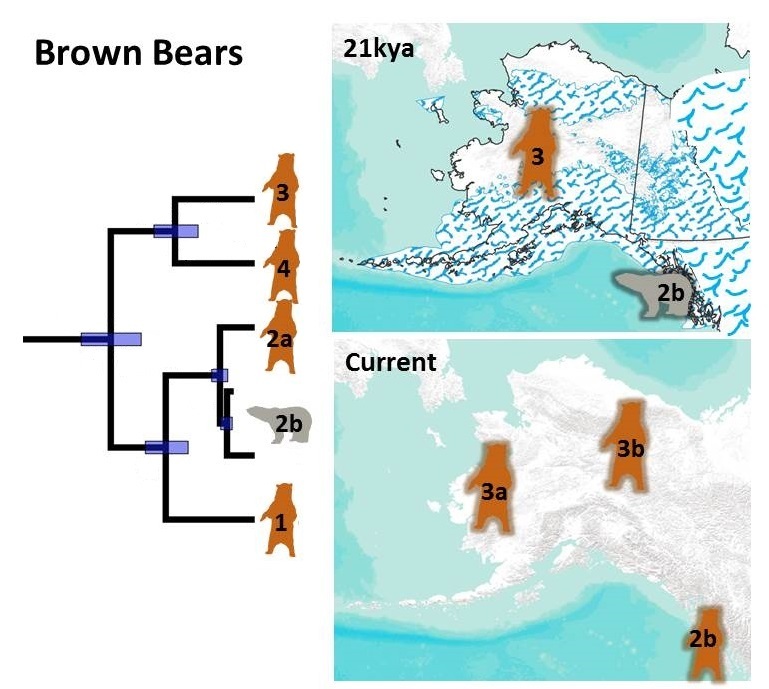 While attending a conference this summer, Beth Shaprio spoke about the unique phylogeography of brown bears on the ABC Islands of Alaska; specifically that ABC brown bears have polar bear mitochondrial genomes. After her talk, I was frequently asked if black bears from the Alexander Archipelago (which includes the ABC Islands) have a similar story. They don’t! But they have their own interesting story I want to tell you about. The black bear and brown bear stories both start with populations that were trapped in Beringia during the Last Glacial Maximum (LGM; 21,000-18,000 years ago). Beringia was the land bridge that formed between North America and Asia during ice ages. As glaciers form over land, they pull up sea water which lowers the sea level; then, plants and animals may spread over the land bridge. Understanding landscape features such as land bridges and the location of glaciers is helpful to phylogeography as species may get trapped in pockets of habitat called refugia. Once a species is in a refugium it can stay there for thousands of years until, as in this case, the glaciers recede and the species may expand their range to the distribution we observe today. We can use genetic signatures, especially from fossils, to understand when different species occupied an area. One expectation in phylogeography is that populations that are closer to each other geographically will also be more closely related in their genetics. This is not the case with the black bears in Alaska, as they are more closely related to bears in eastern North America instead of western North America! This result is very exciting because it is a previously unobserved phylogeographic pattern. Previously, bear biologists hypothesized that during the Last Glacial Maximum, that bears lived on Haida Gawii and slivers of the coast of British Columbia and Washington State. They hypothesized that it was these bears that recolonized much of the Pacific Coast after the retreat of the ice sheets. No one had ever reported black bear fossils from Beringia despite brown bear fossils found in that area. This resulted in thinking that brown bears lived in Beringia but not black bears. My results identified three genetic groups across the range of the black bear, which I call Alaskan, Eastern, and Western. I hypothesize that the Western group diverged first around 67,000 years ago, and colonized the southwest. Then the Alaskan and Eastern groups diverged from each other, about 31,000 years ago. Once the ancestors of today’s Alaskan bears arrived, they were trapped as the Cordellerian ice sheet covered the southern coast, Yukon, and British Columbia. During this isolated period, genetic drift could act to further differentiate this group from Eastern bears. Nuclear phylogeny between three groups of black bears. New data suggests the refugial location for black bears was in Beringia instead of ice free Haida Gwaii. Currently, Alaska and Yukon have black bears from the Alaskan group, but the southern Alexander Archipelago also has Western group bears. The story of brown bears in Alaska is different in several ways. First, brown bears came to North America from Asia; whereas black bears speciated in North America. The first wave of brown bears were in southern Canada before the Last Glacial Maximum, while the second wave came during the Last Glacial Maximum. Phylogeography of brown bear mitochondrial genomes shows that the first wave had clade 4 haplotypes, while the second wave had clade 3 haplotypes. What makes the ABC Island brown bears so special is that they have clade 2 haplotypes, which is the same type as polar bears! Thus, a lot has been written about the ABC Island brown bear population as they play into a larger story of how recently brown and polar bears diverged, with implications for how fast mammals may evolve in the face of climate change. A paper by Cahill and colleagues (open) explains why the ABC brown bears are so unique. They hypothesized that a polar bear population was trapped off-shore due to the LGM ice sheets. 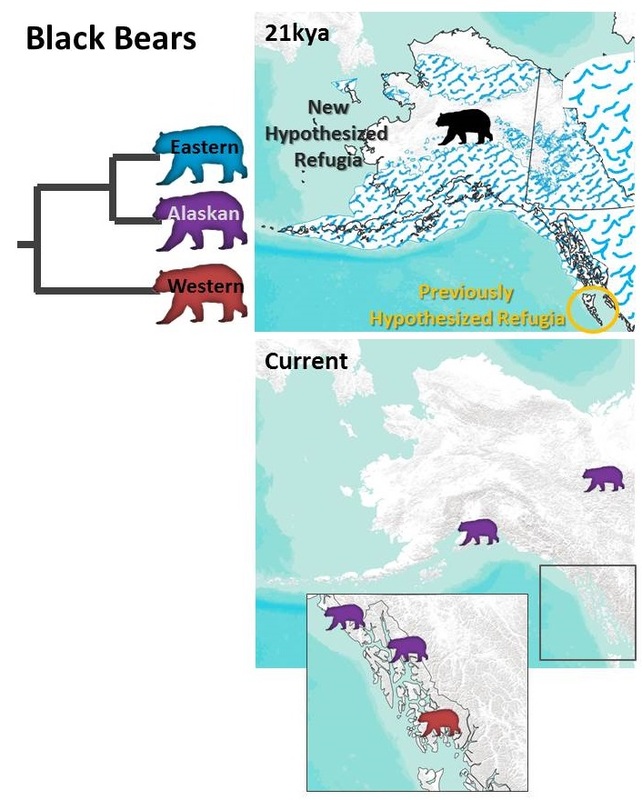 After the ice sheets retreated, brown bears moved onto the ABC Islands and one-way matings between male brown bears and female polar bears eventually produced a population that looks like brown bears but has polar bear mitochondrial haplotypes (since the mitochondrial genome is inherited from mothers). When the researchers studied the X-chromosome, they observed a higher proportion of the X with polar bear ancestry than either the autosomes or other X chromosome of brown bear populations that did not have polar bear ancestry. Mitochondrial genome phylogeny for brown and polar bears showing clade numbers. During Last Glacial Maximum, a population of polar bears lived off shore of the ABC Islands. After glaciers receded, male mediated introgression of brown bears into the polar bear population resulted in a brown bear population BUT with a polar bear genome. Phylogeny adapted from Puckett et al 2015. Both black bears and brown bears have unique and complex histories due in part to retreat into Beringia, then movement out of the refugium once the ice melted. Both species also have mixed genomes, although the mixing came about in different ways. In black bears this mixing comes from different groups of bears coming back together or admixture. While in brown bears the mixing arose from introgression of one species into another.